Looking for a way to make your performance or event more professional? 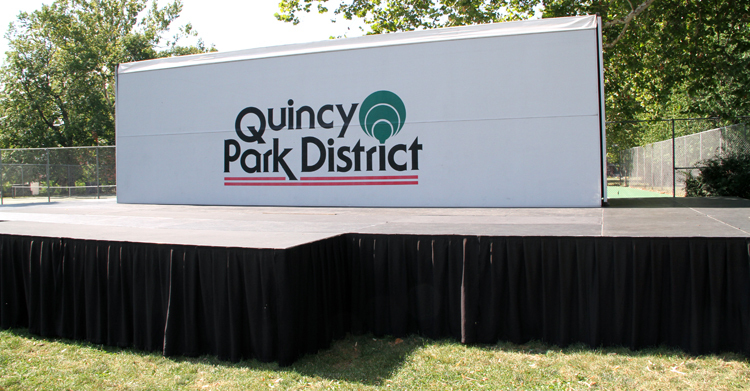 The Quincy Park District’s showmobile is just what you need, it offers a flexible stage-size and is great for virtually any event or outdoor gathering. Rental fees include all Showmobile transportation, set-up and take down. Stage with no extensions:(Size 14’8″ x 32′) $575 up to two days, not-for-profit groups. Profit(Private, Business) $800. Stage with extensions:(22’8″ x 48′) $875 up to two days, not-for-profit groups. Profit(Private, Business) $1,100. Additional fee of $200 if set-up/take down occurs on a Saturday or Sunday. $35 per hour for any additional set-up/take down or other non-standard set-up/take down costs. A deposit of $250.00 is required at the time of reserving the Showmobile.